Scotch trifle fit for Queen Victoria, scones with clotted cream. . .Alys Redcake knows the way to a man's heart. Yet she is unaware that with each morsel--and flash of ankle--she is seducing the handsome marquess frequenting her father's tea shop. Unmarried at twenty-six, Alys's first love is the family business. 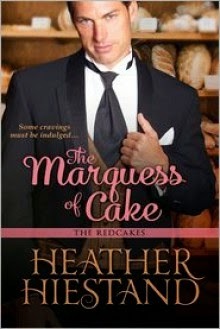 But thoughts of the gentleman's touch are driving her to distraction. . .With his weakness for sugar, the Marquess of Hatbrook can imagine no more desirable woman than one scented with cake and spice. Mistaking Alys for a mere waitress, he has no doubt she would make a most delicious mistress. And when he finds himself in need of an heir, he plans to make her his convenient bride. Yet as they satisfy their craving for one another, business and pleasure suddenly collide. Will Hatbrook's passion for sweets--and for Alys--be his heart's undoing? I absolutely adored this book. It has the perfect balance of wittiness and romance that I enjoy. Michael and Alys' chemistry was built over time in a very natural way. It was written in a modern tone about the Victorian era which made it easier for me to read. This is my first historical romance read and a great introduction into the genre. It was interesting to me that the author included so much information about medical issues and how they were dealt with back then without making it feel like it was forced. Michael being an undiagnosed diabetic, Rose having asthma, Lady Hatbrook's gallbladder, etc. were all part of the story without being the focus of the book. These ailments were just part of life and dealt with accordingly and didn't detract from the story at all, which I appreciate. Not every character was the pinnacle of appropriate or gentlemanly. I like supporting characters that add a bit of flavor and drama without being over the top and Hiestand did a wonderful job with this cast of characters.